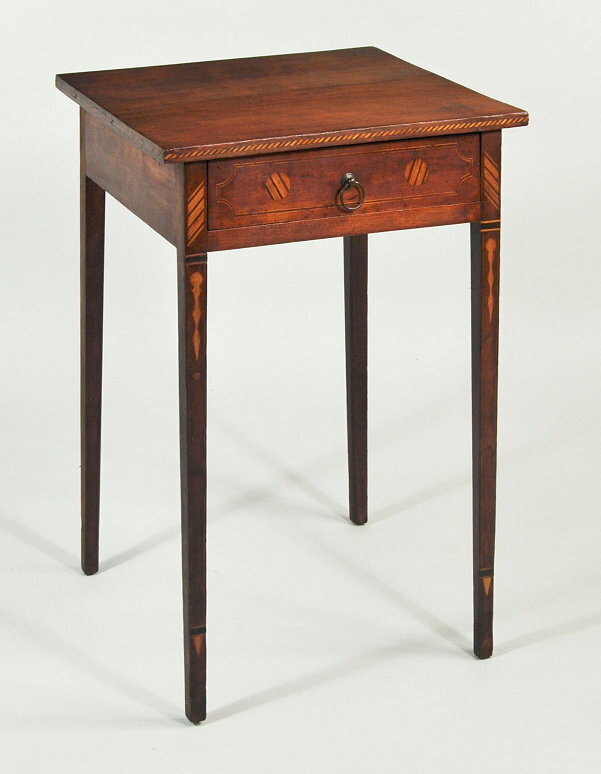 Exceptional hepplewhite inlaid cherrywood one drawer stand, with extensive geometric inlay around the square top, raised on square tapering legs, with exaggerated chevron inlays, round inlays, figural inlays and string inlays on the drawer, stiles and legs, bearing an early label on the interior of the drawer reading "This table was presented to Eunice Gallup on her tenth birthday October 5th 1810 by her father Nathaniel Gallup". Connecticut River Vally, circa 1810. 27 1/2" high, 20" wide, 20" deep.